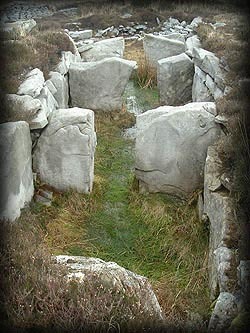 This very impressive well preserved court tomb is situated in a peat bog one and a half kilometres west of Rathlackan. The tomb was excavated in 1990 and the court and chambers are still exposed. I thought it was going to be difficult to find this site, but found it to be easily accessible. The tomb is right beside a track running north from a by road. 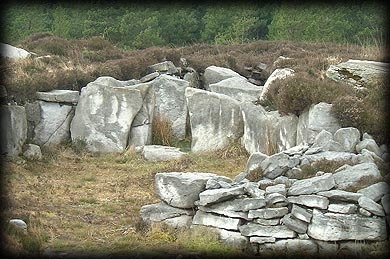 The roofstones have been moved from the gallery and are now resting on the sides of the cairn. The image left was taken from the southern half looking across to the orthostats forming the northern half of the court. 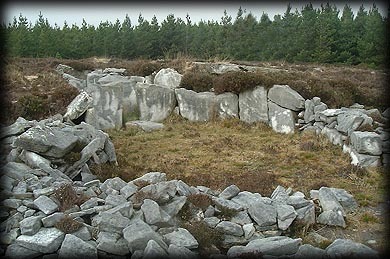 As can be seen from the image below this megalithic monument has a six metre long gallery consisting of three distinct chambers separated by two pairs of large jambs. One rare feature of this tomb is the thin doorstone visible in the image shown right, it has been moved to the left of the gallery entrance. I love the almost silver colour of these stones against the rich earthy brown colours of the peat bog. There are a number of other megalthic sites to found in this vicinity so there are plenty of good reasons to visit this amazing court tomb. Situated: From Ballina take the R314 North through Killala, then about 1 kilometre after Palmerstown Bridge take the first right then after 6 kilometres about 1 k before Rathlackan turn left at the crossroads, just over 1 kilometre there is a track on your right the tomb is about 150 metres down this track on your left. Discovery OS Map 24: G 1656 3876. Last visit Apr 2004.